Before you know it, 2015 will be upon us. I like to set a personal "theme" for each new year; it's a practice that I find helps keep me grounded in my intention throughout the year. I pick a word, sometimes two, to represent what I most want to accomplish in the coming year. Honestly, I've always thought this was a bit nutty and kept it to myself, until I came across author Chris Guillebeau, who mentions in his book, "The Happiness of Pursuit," that he does the same thing. Cool, I'm not alone. Anyone else do this? I've already decided that the theme for me in 2015 is going to be IMPACT. It's something of a no-brainer for me to pick this theme, given that I've learned so much about impact this year. In a leadership development group I've participated in throughout 2014, we've been talking about responsibility for impact -- the ways, good and bad, that we impact people -- through our actions, with our words, and simply by being who we are. How we "show up." And take responsibility for it. More often than not, people see positive traits in us -- traits that are so natural and easy to us that we take them for granted. I don't know about you, but when I first heard the idea of "taking responsibility for your impact" I thought of it in an "Uh-oh, what did I do wrong?" sort of way. The concept, however actually means quite the opposite: understanding and then "owning" the positive impact we have on others encourages us to step up our game, play full-out, and in the process we end up creating more positive impact. Sally Hogshead, author of the New York Times bestseller, "How The World Sees You," has taught me tons about impact. Her book and her Fascination Advantage Assessment can give us a glimpse not only of how the world sees us, but also what is most compelling about us -- in other words, the natural impact we have. Understanding that you have impact on others, knowing what the world finds most impactful about you and taking responsibility for that impact changes your life. In one way or another, everyone I have met this year has either taught me about impact or been a mirror for me to see the effect of the impact I have. What has grown out of all this, and what I'm most excited about sharing is what happened today in my business: we've established a Monthly Impact Meeting. 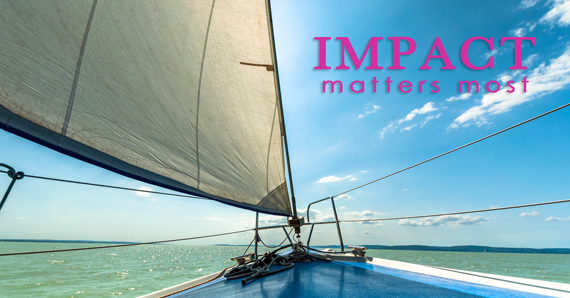 Now, instead of counting the dollars, evaluating budgets, or looking at sales goals, we will measure impact. This is an idea I hope will catch on for other entrepreneurs. How many people have opted-in to our database that we can create lasting relationships with? How many people have downloaded our useful resources and free content? How many new Facebook "Likes" and Twitter followers can we offer insightful thoughts to, and share the wisdom of others with? How many more listeners of our Creative Warriors podcast are benefiting from the knowledge of our guests? How many more entrepreneurs have reached out for business coaching and support? I set an intention earlier this year to impact 50,000 lives a year, having no idea how that was going to happen, and guess what? Now, I may have to increase that number. What I know for sure, though, is that when we focus on the impact we want to have on the world, we find that what we want for ourselves will follow. Not sure whether to believe me? Read "The Go-Giver," in which authors Bob Burg and John David Mann offer The Law of Compensation--which stipulates that how much you get compensated is directly proportionate to the number of people you impact and how well you serve them. In other words, you get more of what you focus on. Think about it: if you focus on what's lacking, what you get more of is "lack." When people focus on money, it's usually the lack of. So, guess what you get more of: More of LESS. Understand the impact you already have on others -- your natural ways of being that people appreciate in you. What do people compliment you on, especially the comments you brush off because they're lauding things so natural to you that you don't know any other way? Value each compliment as an acknowledgement of impact you have that others appreciate. Get comfortable with the impact you create. It might sound obvious, but sometimes it's not so easy to do. I have often found myself giving a public presentation and wanting to move people in a positive way, yet as I look out and see the audience genuinely moved and emotional, I find the impact I've just created can be a lot to hold. So I've worked on learning how to stay in the moment, because otherwise that unease I feel can cause me to move on too quickly. So I'm sharing this with you now to encourage you to own it and stay with it. Be generous. Once you see the positive results you can create with your awesomeness, give more of it! If you know that you inspire people and that's what people find most compelling about you and want more of it, then give more of it. And learn to show up at your best as quickly as possible. Set a goal for the impact you want to create. Think big. Imagine it even being out of reach. In many ways, impact is an ethereal thing to try to measure. So it really doesn't matter how you measure it. The idea is for it to FEEL big, exciting, slightly out of reach and like a journey. Quantify your progress. I've described what I'm going to do to assess this kind of growth in my business, and if you, too, can come up with a way to actually measure the impact you're having, terrific. Are there specific numbers you can track? Visitors to your website? Feedback from clients? Reviews? Look for creative ways you can measure the results. Make it a positive experience. It's so important the numbers be big. And the progress may not always be linear. But your consciousness of the impact you're creating is what's most important. Have fun! I love this idea of emphasizing the measuring of impact over the measuring of money in business, and it's an idea I'd love to spread. The money will follow. I'm confident about that. Like most everyone else, I have a big life with big expenses and soon, the expense of three kids in college. But money will not be my target. Impact will. Imagine the impact on a changed world of this state of mind. And trust that the impact we make will reward us in like measure.